A cold damp day with a sea fret and cold east winds and the promise of a sunny day over the Pennines made for an easy decision where to go and with only limited discussion there was total agreement that we should head for the sun! As usual in these circumstances the weather improved fast as soon as we got through the Tyne Gap and at Brampton we got out of the car to the promised sunny weather. We decided to walk the section of Hadrian’s Wall from outside Brampton to Greenhead and then get the hourly express bus back (currently no. 685) from Greenhead to Brampton. Hadrian’s Wall Path is not a particular favourite of mine, although it attracts thousands of visitors, but it does have its moments and to me this stage is arguably the best. It has fine views throughout, is in good open country and is generally much quieter than the next section east which it shares with the Pennine Way and Wainwright’s Pennine Journey as well as many one-day visitors. The opening section of Hadrian’s Wall Path from Bowness can be pleasant albeit with a substantial amount of quiet road walking but the extensive views across the Solway and the big skies plus the abundant birdlife make this a good day for many, even though there is no Hadrian’s Wall to see. The second section from Carlisle to Hayton Gate where we pick up the National Trail today is a peaceful walk through arable countryside and it is just after Hayton Gate that the Roman interest really becomes visible. There is an excellent route out from Brampton which starts at where the road to Lanercost leaves the A6071 at the eastern end of town and a footpath here heads initially north to a cottage and then east up onto the ridge. This section has fine views north to Scotland and passes through superb beech woods with many fine trees owned by the Woodland Trust, before descending diagonally down across a field to emerge at a road and the route is waymarked throughout. There is a footpath sign where you emerge on to a road which directs you to the right to Quarry Bank Burn and Lanercost. This was not marked on our Explorer map as a right of way but all the signs say it is a right of way, and indeed this is a very nice old path which follows the burn, again through superb beechwoods. After passing the small quarry specialising in the red stone of the area the path rejoins the road at Lanercost Bridge, built by four stonemasons in 1724 and which was in use to 1962 before being replaced by the new one alongside. 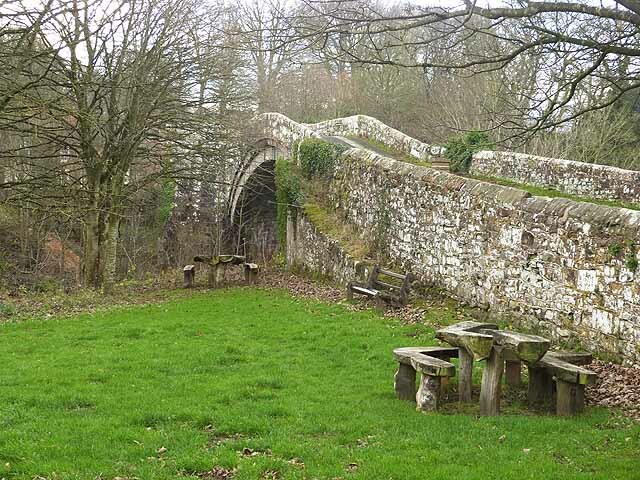 The old bridge was refurbishes in 1998 by Cumbria County Council with help from the Heritage Lottery Fund but it is worth mentioning that it was replaced because of its lack of width and not its capacity to carry heavier loads. Ahead of you is Lanercost Priory which is worth a visit and also boasts a good tearoom. Sadly the Bridge Inn which was at the side of the old bridge, and in the past had very good food, is no more and is now a bed and breakfast establishment. Just after the abbey the road turns sharp right and here we leave it and have a choice of a footpath to Hayton Gate. This is in fact a surfaced road leading to the farm and there is an alternate bridle way a shade further west from the same point which passes to the west side of Abbey Gills Wood to pick up the Hadrian’s Wall Path. I do not propose to put much here on the route as this is well covered by the various guides to the Hadrian’s Wall Path although you pass the highest standing part of the wall at Hare Hills soon after joining the trail. It is generally thought that this was reconstructed during the 19th century. 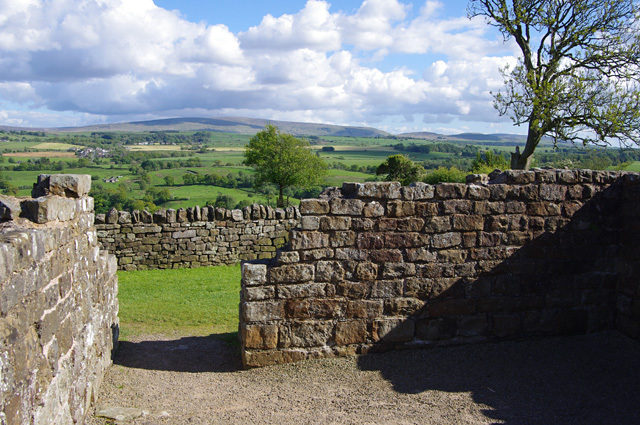 There is an excellent seat for lunch near the top of the hill at Banks with fine views of the Eden Valley and the more distant Lake District hills. Leaving Banks you have wide views on either side noting the end of the Pennine Chain to the south and its highest point hereabouts which is Cold Fell. 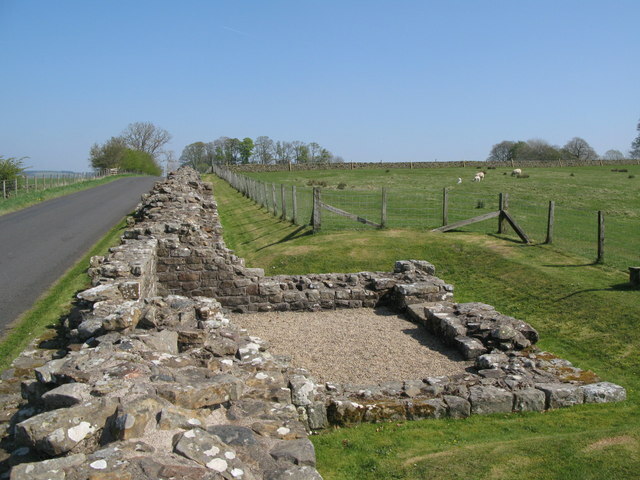 Birdoswald fort, known to the Romans as Banna, is top class and the new bridge at Willowford is in a superb setting. This was the first bridge to be erected on this site since Roman times. Equally interesting, close to Gilsland which is passed by the south, is Poltross Burn milecastle which has been well preserved, including a surviving flight of stairs in spite of the construction of the nearby railway in the 1830s. After this the path follows close to the Vallum and after Longbyer farm you reach the B6318 road. Go right along the road and after 200 yards you will see the Pennine Way coming down over the golf course to your right and joining the Hadrian’s Wall Path. Turn in front of the row of houses to cross the river and here you leave the Hadrian’s Wall Path and Pennine Way and follow the cycle way into Greenhead. I have not included the bus times as they are liable to change. However take care as the express bus does not enter the village and stays on the A69. This is reached NOT by taking the road up higher up from the pub but instead going along the street to the left which has a “no exit” sign. This takes you along a path to the A69 and the bus stop east. To get back to Brampton use the underpass to reach the bus stop west. The timetable is on the wall in the Greenhead Hotel which not only serves good local real ales but also does good bar food and is open all day. The trip back to Brampton is all on the A69 and at 50mph takes about 10 mins. It is worth mentioning that during the summer there is a special bus for walkers which goes at least to Birdoswald and east of Greenhead past all the honeypot places such as Crag Lough and Housesteads. For those who want a lot more of the history of the wall there are several books but the best is the classic of 1863 called “The Handbook of the Roman Wall” by J. Collingwood Bruce which is beautifully illustrated. My copy is a newer version which is the seventh edition dated 1914. This entry was posted on Thursday, September 10th, 2015 at 12:28 pm	and is filed under Other.